Get Toyota Complete, including Oil Change, Tire Rotation and Multi-Point Inspection for as low as $29.95. 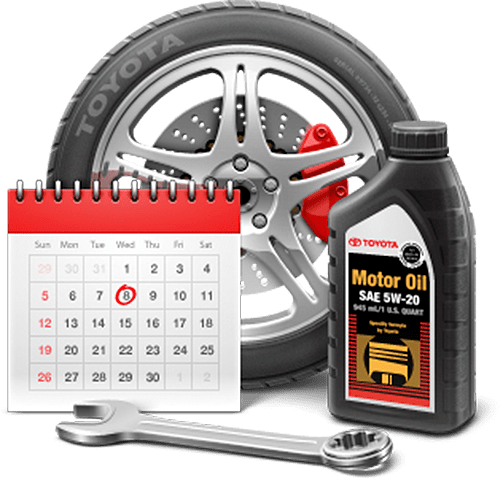 If you have a ToyotaCare (TC), Scion Service Boost, (SSB), or ToyotaCare Plus (TCP) plan, this service may be at no cost, in which case, this offer may not be applicable. Please refer to your plan for complete coverage details. See your Toyota scheduled maintenance guide for additional mileage-specific recommendations. Toyota requires 0W-20 synthetic motor oil for some 2010 and newer models at 10,000-mile intervals. Toyota synthetic motor oil slightly higher. Up to 5 quarts oil. Installation and labor included. Tax and shop supplies extra. Some models higher. Valid in Alabama, Florida, Georgia, North Carolina, and South Carolina. See your local Toyota dealer for details. Please present offer when order is written. Not valid with any other offer, advertised special or prior purchase. Some restrictions may apply. Toyota and Scion vehicles only. Offer valid 9/1/15 - 9/30/15.